Earlier I outlined what you will find if you type “Syria Solidarity UK” into google. But what if instead you type “Syria Solidarity Movement” – that other name for the same organisation? The top link then turns out not to be the campaign group co-founded by Abdulaziz Almashi and Mark Boothroyd, but a totally different and unrelated “Syria Solidarity Movement”. An organisation that adopted the domain name syriasolidaritymovement.org long before Almashi and Boothroyd decided to create their alternative. So the immediate and most obvious question is this: why adopt the name of a pre-existing campaign organisation? An odd decision made odder since it automatically denies you ownership of a matching domain name. Indeed, can there be any rational explanation other than here is a case of deliberate identity theft? A new campaign group, with an outlook diametrically opposed to its rival, set up deliberately to overwrite it. Not conduct befitting a benign human rights organisation. 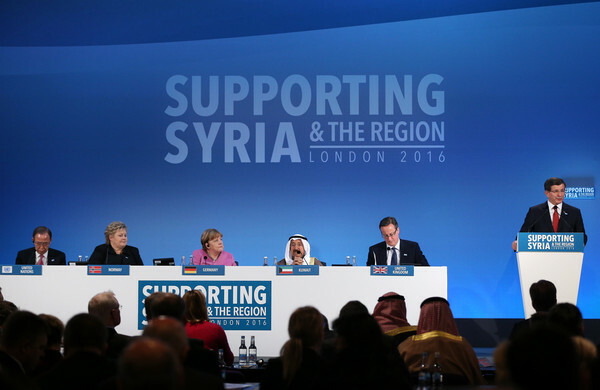 On Thursday [Feb 4th], David Cameron, Angela Merkel joined with lesser lights Erna Solberg, the Norwegian Prime Minister, and the Emir of Kuwait, Sheikh Sabah al-Ahmad al-Sabah in London to host the “Supporting Syria & the Region 2016” conference.